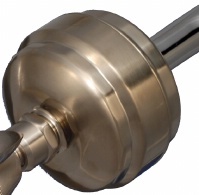 Solid metal Brushed Nickel Slim-Line shower filter without a showerhead. Filter lasts roughly 6 months. Choose this option if you already have a showerhead you like or want to add a Oxygenics showerhead. Slim-Line® Low Profile Shower Filters use a low profile "Extend-A-Path"TM baffle system. The shower head extension is less than 1.5". The Slim-Line Shower Filter housing is designed for smaller showers where head room is at a premium. The shower head offers a gradient of different sprays, including pulse massage. The Slim-Line All Metal Brushed Nickel Shower Filter has a low profile design, with a shower head extension of less than 1.5 inches. The All Metal Slim-Line is solid metal shower filter housing that comes in elegant jeweled polished brushed nickel finish. A swivel ball in the showerhead allows you to adjust the spray direction at a finger's touch. The all metal housing unscrews in half for easy cartridge replacement. The filtration cartridge uses patented Chlorgon, a non-carbon media used to remove more chlorine at a wider temperature range than any other, making it especially effective in hot showers. The cartridge life rating is six months or 10,000 gallons, whichever comes first. The Sprite Slim-Line replacement filter uses patented Chlorgon® and KDFTM filtration media, which typically lasts six months or 10,000 gallons whichever comes first.